GRRR!! .. I get that it has only been 3 weeks. Maybe it takes longer? Who knows. That should be a question I ask next week. How long does it take to make a real change? REALLY? This week we learned about nutrition. Same old same old right? How many times have we been beat over the head with healthy eating? Eat nutritious foods, don’t eat bad foods. Period. Stephanie decided instead of giving us the Nutritional Science lecture, to give us some handy dandy tips for us to try. I will share 5 of them with you. You like bread? Whole wheat instead of white. Pasta, sliced bread, hot dog bun, however you like it, there might be a whole wheat version. Get it. White ain’t right.. Brown is better! Need to cook with oils? Olive or Canola. Why Olive? Omega 3 Fatty Acids. Very helpful in reducing high blood pressure. You can’t really cook olive oil in high heat (it breaks down those essential nutrients) so if you need to fry..Canola is your guy! Beans, beans the magical fruit! They are a natural source of protein with out the fat. Half a cup of Lentils have 9 grams of protein. I have never had a lentil. Anyone got a recipe? Incorporate more greens! OF the lettuces, Romaine has the highest nutritional value. Then try spinach, swiss chard and collards. I like to make spinach and tomato sandwiches. Whole wheat with the crusts cut off. Sipping on tea with my pinky in the air. 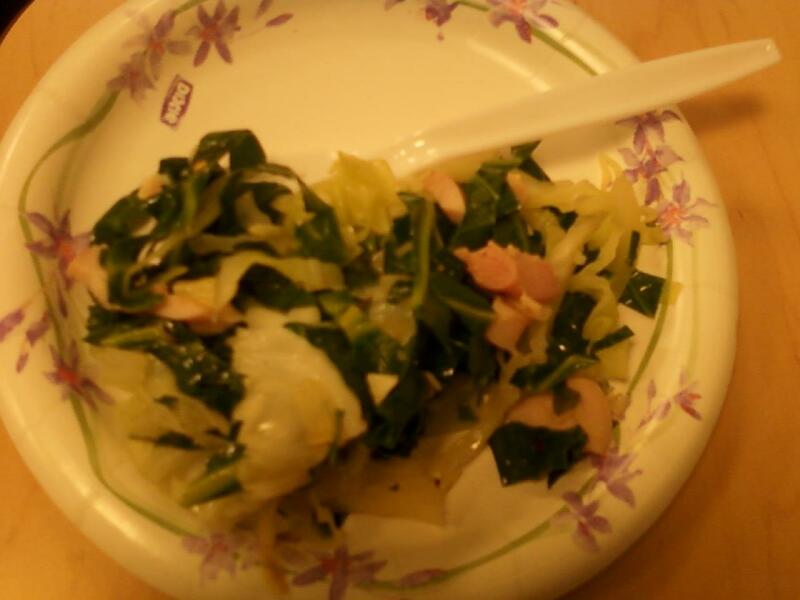 Try this recipe of sauteed collard and cabbage from the American Heart Association. MMM mmm good. LOSE the salt. For real. Previously, I stated that the RDA is 2400 mg. That’s if you have normal blood pressure. It’s 1500 mg for abnormals like myself. Luckily I am not a big salt person, HOWEVER, I do like some lemon pepper, and wouldn’t you know it- but some lemon pepper brands have salt in it! BOOOOOO!!!! Check your labels folks. Especially if you like buffalo wings (2460 mg), spaghetti sauce (1450 mg), canned chicken noodle soup (1106 mg), Potato salad (1323 mg)..you know normal stuff. By the way: Alameda County Public Health Department’s: Healthy Living For Life has a lot of great tips for you the try. Check it out!